Note: Our Crucible card scrapers sold out in just a few hours. We’re in the process of making hundreds and hundreds more and hope to have them up for sale in a couple weeks. If you didn’t get a chance to purchase one of the Crucible curved card scrapers, you can make your own with a dry grinder and an existing card scraper. It takes about 30 minutes. Download and print out the following template. It’s a hand-drawn version of Chris Williams’s scraper, which is where our design started. Cut it out and affix it to your card scraper with the help of spray adhesive. Or make a cardboard template and trace its shape on your scraper with a permanent marker. At your grinder, set the tool rest to 0° – parallel to the floor. Dress the wheel of your grinder (we use an #80-grit wheel, but a #60 or #100 will also do) so it has a slight convex shape. This convexity in the wheel makes the scraper easier to shape. Get a bucket of water and put it by the grinder. 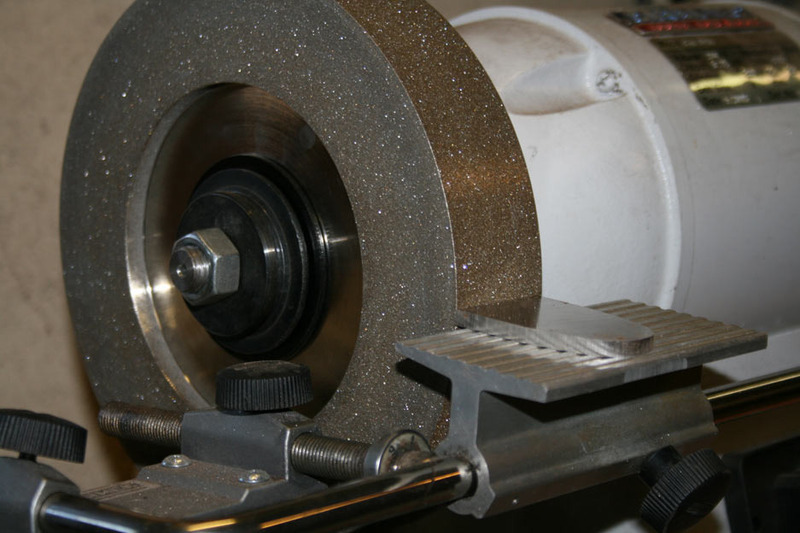 Place the scraper on the tool rest and start grinding the excess metal away. Don’t work on one part of the scraper for more than a few seconds. Keep moving around the perimeter. After 10 or 15 seconds, try to pinch the scraper with a finger and thumb. If…. … you can pinch the scraper with no pain, continue to grind. … your fingers reflexively jump away, cool the scraper in your water bucket. … you smell bacon, also cool the scraper in the water bucket. Once you have ground down to your line, you will have become pretty good at grinding flat shapes – congrats. Now you need to remove the grinder marks from the edges. 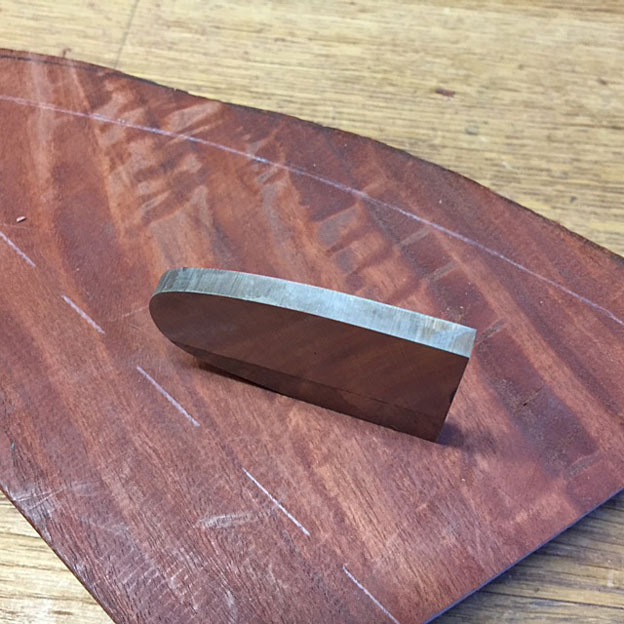 Use a block of wood to hold the scraper at 90° on a coarse diamond stone and stone the edges. Remove all the scratches from the grinder. Then move up to a #1,000-grit waterstone (or soft Arkansas) and then up to a polishing stone. Then you can proceed with normal scraper-sharpening procedures. This is exactly how I made all of our prototypes. I promise that you will become emotionally involved with your scraper after putting all the work into it, and you might not ever want to buy one of ours. Exactly as Christopher promised a while ago. He’s a man of his word. I have a scrap of saw blade set aside, and I was also fortunate enough to buy one early in the day. Can you put the outline of the magnet up as well? Ha, I was joking, man. Any chance of coming around our houses and grinding then for us as well, Chris? It’s the least you could do; you’re just not helping us out enough here. True. True. Please publish a list of your addresses with locations of public parks where I might sleep, and I’ll get on my bicycle immediately. Can you put up an outline of your grinder? Then I’ll post my address. Awesome. I knew you’d find it in you to be generous eventually. I finally feel like I can support you by reading your free content again. BTW: I had an old BAHCO thick card scraper . Never been able to make a decent tool out of it until… I printed your plan , used a cutting disc for the rough , grind it, followed you instructions (and a mix of Bob Rozaeiski technics): the BEST card scraper I have ! Thank you thank you. i made some of these a few months ago when you first posted the pattern. i made a template out of 1/4″ plywood and shellacked it. great scraper. when i get some money i’m going to buy one of yours as well as a thank you. And here I thought the statement, “you could make your own” was instruction enough. Now with the promise of Bacon, how can we resist? It is man-bacon that you make yourself. This is all great but you forgot to do a detailed walkthrough on how to turn on my bench grinder. I’m really starting to loose patience with this free blog. Apologies. A team of “switch revealers” has been dispatched to your… Oh wait. You’re in Canada. Sorry. Pound salt. So, I didn’t get in to order in time. Is there a wait list for the next batch? If so put my name on it please? Is it possible to make these from an old saw? Don’t know how Christopher would answer this, but I’ve had very good success using remains of a vintage Disston that some previous owner had manged to kink. Yup. Cutting down the plate to a scraper-sized chunk is usually the biggest obstacle. 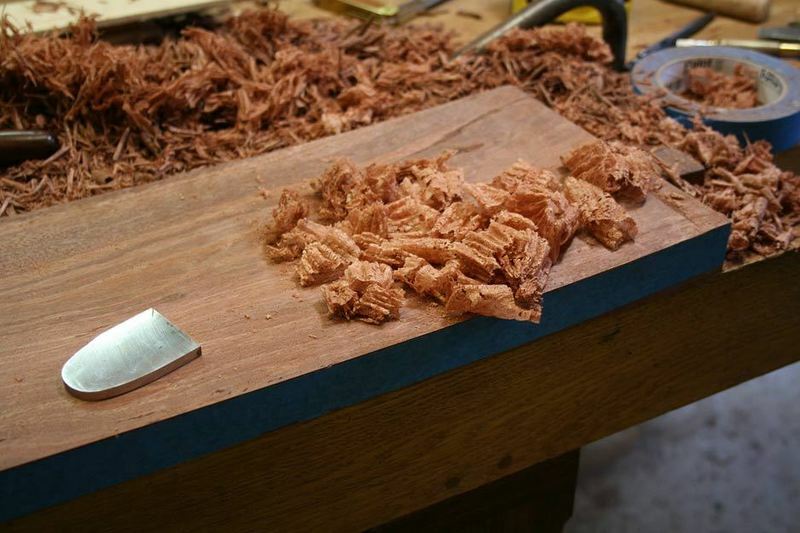 I’ve used a nibbler, but it’s not a common tool in most woodshops. Cool. Cutting it down is the easy part for me. Takes about 45 seconds on a stomp shear. Ive never used a scraper so ive been hesitant to buy one. Almost got one of yours but I hesitated. I knew I shouldn’t have. I just don’t have any woodworking projects at the moment, so just didn’t need it right now. If gentle a zip disc on an angle grinder works a treat. They don’t generate a lot of heat and I have found with repurposed saws I can trim all the old teeth off and start afresh with no loss of temper if careful. Bit quicker than grinding the whole line flat. The dremel cutting discs can work well too. I can’t vouch for it’s effectiveness in steel long term but I found a nibbler drill chuck attachment a couple years ago. It works great on brass but I’ve not gone at it in steel to find out if it can get through a saw plate. I think .032″ is the sweet spot, but thicker and thinner scrapers are also beloved by other woodworker. I made mine the day you posted about it in 2018. The shape made sense to me. I have not picked up any of my 6-7 other scrapers since. And I used to think those rectangles were the best tool in the shop. Agree! I had the same experience. I have always first cut my card scrapers (from TGIG) to approximate shape with tin snips. Then ground to final shape using sometimes a ceramic belt on the belt sander. This stays much cooler. A great solution for those woodworker who have that machine. I didn’t own a belt sander/belt grinder until I started making tools. As to tin snips, you must have an awesome pair; I’ve never owned any that are up to cutting hardened steel at .032″. That’s thin (in my book). The scraper I use in my work are .032″. Well the work fine for what I do. Spoons for example. Downloaded template expand it to b larger! One of the guys I took classes with at Connecticut Valley School of Woodworking took a course with Phil Lowe, about 6 or so years ago. He taught them about this style of card scraper and I, in due course, made one as well. It certainly is a big improvement over the plain rectangular ones. And, as Mark Adams taught us at WIA/2010, you can sharpen the short sides of the scrapers as well. Just be careful where you put your fingertips when in use. Chris, I am curious about the thickness of your scraper. I do not recall reading anywhere what this was, and assumed it was standard fare (as per a saw blade – 0.02″). For some years I have been posting about the scraper I use a lot of the time. I made this from the rear half of a 3/16″ O1 parallel plane blade. It has a flat side and a curved side. It sharpens simply by hollow grinding (I use a 180 grit CBN wheel). No burr, etc. Stewmac make something similar. However I credit the idea to Philip Marcou (planemaker), who once mentioned to me that he had done this with D2 steel (or similar). The reason I ask about the thickness of your scraper is that one of the aims of yours is that it does not have to be bent with the thumbs. The curved shape permits this. A thicker blade would also do so, and the hollow-ground-created-burr is so fast to do. One might expect that the result is a coarse finish, but it leaves a smooth surface in its wake. Our scraper is .032″ thick. I’ve used that StewMac one – one of the other editors had one back in the lat 1990s or early 2000s, if I recall. Effective but heavy. I have one that is similar in shape, but I have never used it. No idea where I got it, but it is labelled ” E Garlick & Son”. Same thickness of .032″, and I probably never used because I am used to flexing the scraper, and thick ones are too tough to flex easily. Now I am encouraged to try it out. It’s cruder than the Crucible tool version, with the small edges sheared off straight, with no radius on the corners. What seems like a nice feature is that the two ling edges have a different radius to them.